Get your free Kombucha Recipe & DIY Guide! This Roasted Beet and Walnut Salad recipe is from The Nourished Kitchen: Farm-to-Table Recipes for the Traditional Foods Lifestyle Featuring Bone Broths, Fermented Vegetables, Grass-Fed Meats, Wholesome Fats, Raw Dairy, and Kombuchas, the soon-to-be-released cookbook by my friend, Jennifer McGruther – click here to pre-order it now and it'll ship the day it's available! Kombucha, a fermented tea of Asian origin, offers a flavor reminiscent of apple cider vinegar: it’s sour, but also mildly sweet. Its flavor pairs well with warm spices like cinnamon, cloves, and allspice, while its acidity is strong enough to stand up against the sweet and earthy flavors of root vegetables and nuts. Beets number among the few vegetables that my family eats year-round, fresh in spring and autumn and stored in boxes of dirt during the cold part of the year. Lacking greens in the winter, we often eat beets as a salad, sprinkled with roasted walnuts and dressed with a spiced vinaigrette. Preheat the oven to 425°F.To prepare the salad, trim the beets by removing any beet tops and the tips of their roots. Dot each beet with a touch of clarified butter, then wrap each in parchment paper and again in aluminum foil. Roast the beets for 45 to 60 minutes, until they yield under the pressure of a fork. Refrigerate the beets for at least 8 and up to 24 hours. Just before serving, heat a skillet over medium-high heat for 2 to 3 minutes until very hot. Toss in the walnuts and toast them for 3 to 5 minutes, stirring frequently to avoid scorching. Remove the cold beets from the fridge, peel them, and chop into bite-sized pieces. 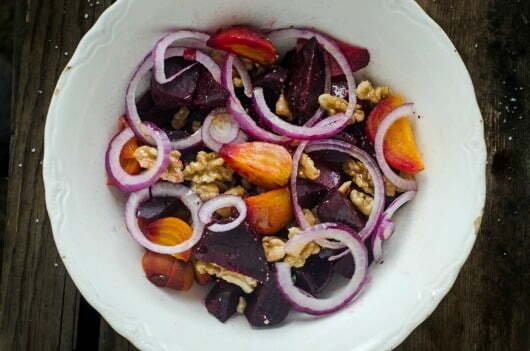 In a large bowl, toss the beets with the sliced onion and toasted walnuts. Drizzle with the vinaigrette, toss again, and serve. 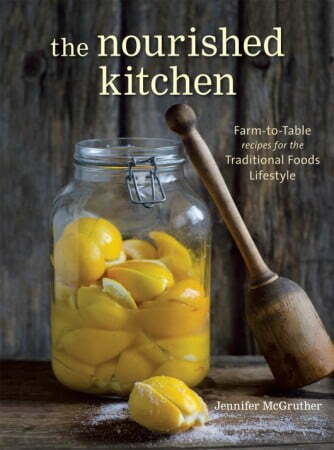 Click here to pre-order Jenny’s Nourished Kitchen cookbook! Wow! this looks so good, I’m planning to make it tonight. Definitely have this book on my list.